Linden Schaffer used to be in the center of the glamorous, high-paced fashion industry, balancing a hectic work schedule, back-to-back meetings and jet setting across the country for early morning meetings with no downtime in between. After finding herself overworked and stressed out, she noticed a menagerie of bad habits she had developed—a poor diet, poor sleep schedule, perpetual brain fog—and she realized that no matter how much she loved her job, her health and wellness needed to come first. So she made some changes, and now stands at the forefront of the wellness travel movement with her company Pravassa. 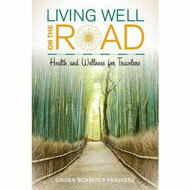 In her book, Living Well on the Road: Health and Wellness for Travelers, Linden provides a wellness plan to help modify your lifestyle to stay healthy physically, mentally and socially and to put your self-care first, even when you don’t feel you have the time. Through tips and tricks backed by scientific research, personal accounts and the latest health and wellness studies, Schaffer helps you refocus your attention on wellness and teaches how to take small steps to change your life, especially on those long trips. Through chapters titled “Get Rest,” “Get Fit,” “Get Zen” and “Get Local,” Linden helps readers to realize that it doesn’t always require massive leaps but simple changes in areas of your life to get you back to being your best self. She offers a how-to manual to recommit to wellness and to remember that even when you’re visiting two cities in one day, make time to refocus and recharge. Your productivity will thank you, too. She even offers suggestions on how to make small changes while traveling that will greatly relieve your stress, improve productivity and heighten your energy while on the road. For one, she suggests trading running yourself thin for a refreshed feel with just a few easy wellness swaps: If you’re on your feet for 12 hours at a tradeshow, skip cocktail hour for yoga instead. If you fly in on a red-eye flight to meet with a client, don’t schedule any meetings in the morning so that you can find time to work out, sit in the sauna or find a way to detox the physical and mental stress of travel. And she urges you to create and find your own ways to embrace true wellness. Linden will never be one to suggest you abandon a passion project or all the work it takes to run your successful business, but this book can guide you to toward keeping your health in check to help you be even more creative and feeling more energized than ever before, getting you that much closer to having it all. WBC2017—Hurry and Save: Early Bird Ends Soon!